One of the most terrifying things that has ever happened to me was watching myself decide over and over again--thirty-five days in a row--to not return a movie I had rented. Every day, I saw it sitting there on the arm of my couch. And every day, I thought, I should really do something about that...and then I just didn't. After a week, I started to worry that it wasn't going to happen but I thought, Surely I have more control over my life than this. Surely I wouldn't allow myself to NEVER return the movie. But that's exactly what happened. After thirty-five days, I decided to just never go back to Blockbuster again. Most people can motivate themselves to do things simply by knowing that those things need to be done. But not me. For me, motivation is this horrible, scary game where I try to make myself do something while I actively avoid doing it. If I win, I have to do something I don't want to do. If I lose, I'm one step closer to ruining my entire life. And I never know whether I'm going to win or lose until the last second. 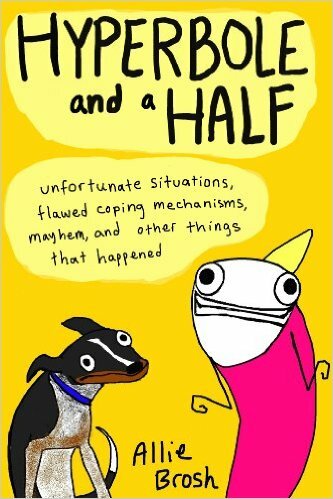 Hyperbole and a Half is a combination of webcomic and blog written by Allie Brosh. The comic is drawn in Paintbrush and uses an exaggeratedly simple drawing style as an artistic device.It is a retelling of her life and includes stories from her childhood as well as the challenges she faces as an adult.